There are thousands of Black-owned restaurants across the country. Some of them serve soul food, while others serve barbecue. And others are just diners or cafes. What ever the case, these restaurants are historic and are known to help their local communities thrive. #1 - Ray's On The Ave: located at 1139 St Bernard Ave, famous for fast service, gumbo and fried chicken, boiled crawfish, and live music. #2 - Fred’s BBQ & Soul Food: located at 3336 S Claiborne Ave, serves some of the best barbecue in New Orleans, along with Mac and cheese, yams, and corn. #3 - Heard Dat Kitchen: located at 2520 Felicity St will more than satisfy you if your craving is for Cajun/Creole, Seafood, Soul Food. Try their crawfish stuffed shrimp, and the blacken catfish and green beans for starters. Good food and southern hospitality. #4 - Bennachin Restaurant: located in the French Quarter, serves some of the best African and Soul food around. From cabbage and couscous (Yasa) to the black-eyed peas and coconut rice with plantains (Kone Ni Makondo), it's all good here! #5 - Willie Mae's: located in New Orleans’ 6th Ward just blocks from the historic Treme Neighborhood and the French Quarter. Originally established in 1957 as a bar by Ms. Willie Mae Seaton. Serves soul food, salads, and more. #6 - McHardy’s Chicken & Fixin’: located at 1458 N Broad St, is a favorite among chicken-lovers. Customers consider their fresh, fried chicken the best in the city. Reasonable prices, too. #7 - Catty Car Corner: located at 1340 Poydras St, has a 1980s style decor and serves cafeteria style, including breakfast. One of their specialties is grilled cheese sandwich made with gruyere, caramelized onions, and prosciutto. Customers say it is "melted high-quality cheese." Try their pulled pork, too. The restaurant is closed for dinner but serves breakfast and lunch. #8 - Terra Cafe: This community-centered and family oriented restaurant, founded by entrepreneur Terence J. Dickerson (pictured above), offers a wide range of delicious food, and a menu complemented with daily specials and seasonal items. The restaurant is also a commonly-used gathering spot for local artists, college students, and more. #9 - Southern Blues: Soul food at its best can be found in the heart of Baltimore at Southern Blues. This popular restaurant, opened in 2000, serves favorites like barbecue chicken and ribs, cornbread, collard beans, sweet potato pie, banana pudding, and lots more. #10 - Darker Than Blue Cafe: This restaurant opened in 2007 and serves country cuisine and jazzy music 6 days a week. Their specialties include cornbread with sweet potato and honey butter, Cajun shrimp and oven fried salmon cakes, grits, oven roasted Free Range Chicken with macaroni and cheese, glazed sweet potatoes, and sautéed spinach. #11 - Fresh Fresh Seafood: If seafood is your bag, guess what this restaurant serves? You'll find all kinds of seafood, including gumbo, shrimp, crab, catfish, and delicious sides like mac and cheese, collard greens, and sweet potato fries. #12 - Dessert Fantasies: If you have a real sweet tooth, you must try the cupcakes at Dessert Fantasies. Owner Tosha draws customers in with her row house with the bright pink accent wall. Once inside, you're hooked with cupcakes like strawberry shortcake, banana pudding, blueberry lemon, cookies and cream, smores, red velvet, and oh, ice cream, too! #13 - Flight Restaurant & Bar: For a nice relaxing dinner, try Flight's varied menu, which includes vegan dishes. They will accommodate special dietary requests, too. Whether you go for happy hour and appetizers, soup and sandwiches, or a dinner entre, you are sure to find a wide selection of home cooked favorites. #14 - St. Mary's Restaurant & Bar: For a peppy atmosphere along with authentic Jamaican cuisine, try St. Mary's located in the beautiful Charles Village neighborhood. From roti to wings, oxtail to Codfish Callaloo with bananas, fried dumplings, and fried plantains, you will love the Jamaican cuisine as well as the reggae music on Saturday nights. #15 - Shareef's Grill (House of Wraps): This restaurant is known for their healthy grilled shrimp wraps. They use all fresh ingredients, which is probably why you see their food truck all over town. #16 - Ben's Chili Bowl: located in the U Street Corridor, this restaurant is a landmark in D.C. The restaurant has been around since 1958, serving their famous chili, chili dogs and chili fries, as well as homemade coleslaw, potato salad, and homemade cakes. Even Barack Obama has eaten lunch here. #17 - Sankofa Bookstore and Cafe: this restaurant on Georgia Avenue is half cafe/half bookstore. They serve breakfast all day and serve sandwiches named after African-American directors like Spike Lee, Billy Woodberry and Charles Burnett. The restaurant is right across the street from Howard University and offers good food plus a cultural environment in which to relax. #18 - Uprising Muffin Company: you probably guessed what their specialty is -- homemade muffins baked daily, including Cranberry Orange, Almond Bliss, Lemon Poppyseed, Pumpkin, Raspberry, Peach Cobbler -- just to name a few. Their muffins contain no preservatives or artificial anything. It's located on 7th Street, close to the metro. #19 - Policy Restaurant and Lounge: located on 14th Street in the U Street Corridor, this restaurant serves some of the finest meals in D.C., including lamb sliders, green beans, sweet potato gnocchi, chicken, steaks, pork belly and short ribs, served with hip hop bumpin' dance music. They are also open for brunch every Saturday and Sunday. Sleek and sophisticated, this is one restaurant you don't want to miss. #20 - Negril Jamaican Bakery & Eatery: located at 2301-G Georgia Ave, NW, this restaurant was founded in 1979 by Earl Chinn, a Jamaican native who saw the need for a quick service Jamaican restaurant in the D.C. He has since expanded to three other locations throughout Maryland. #21 - Batter & Berries: This 3-star restaurant in the Lincoln Park area serves favorites like crab eggs benedict, cheesy hash browns, and sweet potato waffles. Owner and chef is Derek J. Rylon. #22 - 5 Loaves Eatery: Located on 75th Street, this black-owned breakfast and brunch restaurant is a favorite with it's salmon croquettes, baked potato soup, and their famous homemade lemonade and sweet tea. The restaurant is family owned and operated. #23 - Three Chefs Restaurant: Located on Halsted, this family-owned restaurant brings people coming back for their sweet potato pancakes, gumbo, catfish and strawberry lemonade. #24 - Peach's Restaurant: Located on S. King Drive, they are known for their salmon croquettes and cheese grits, and peach-flavored coffee. They are considered one of the best restaurants and serve breakfast all day, and brunch. #25 - Litehouse Whole Food Grill: Eric, known as Mr. Litehouse Grill, opened Litehouse Whole Food Grill to bring healthy fast food to his community. Located in Hyde Park, the restaurant features fresh, wholesome food that lives up to its slogan: "Eat Fit. Live Whole." 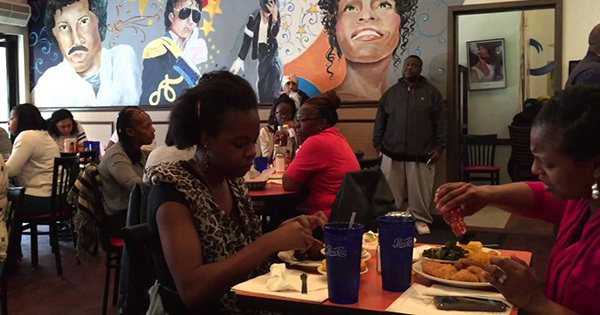 #26 - Busy Bee Cafe: This favorite eatery has been serving tasty soul food since 1947. They are known for their chitlins, ham hocks, meat loaf, and fried whiting, as well as dessert specialties like banana pudding, red velvet cake, key lime cake, and lemon pound cake. Gotta get there early because they close at 7:00 p.m.
#27 - Mary Mac's Tea Room: This restaurant remains the only tea room left in Atlanta. Since the 1940s they've been serving soul food favorites like fried okra, salmon cakes, fried shrimp, fried green tomatoes, fried chicken tenders, fried crawfish, ribs and sweet tea, or, as it is known locally, "Table Wine of the South." #28 - Gladys Knight Chicken and Waffles: Owned by, you guessed it, singer Gladys Knight, this popular soul food restaurant knows how to draw a crowd. Their dishes include collards, mac n cheese and chicken and waffles. For vegetarians, there's also a choice of 4 vegetables called Veggie Soul. Save room for dessert, too, with a slice of delicious sweet potato cheesecake! #29 - Soul Vegetarian 2: If you are all vegetarian, there is soul food for you, too, at Soul Vegetarian 2. They serve healthy and nutritious soul food favorites like barbecue tofu and vegan ice cream. What they don't serve is alcohol or any caffeine. #30 - Beautiful Restaurant: This south-end restaurant has been in business for more than 30 years, serving soul food favorites like fried chicken, collards, green beans, mac n cheese and cornbread. The restaurant is cafeteria-style, and they open early and close late. #32 - Amy Ruth's: located on 116th Street, established in 1998, is open 24 hours to serve up your favorites, named after celebrities. They include The Nate Robinson (BBQ ribs), The Ruby Dee (catfish), and of course, The President Barack Obama (fried, smothered, baked or BBQ chicken). Owner Carl S. Redding named the restaurant after his grandmother, Amy Ruth Moore Bass. #33 - Melba's:located on W. 114th Street, Melba's opened in 2005 and is owned by Melba Wilson. It is considered the ultimate in comfort food, like catfish strips, southern crab cakes, and of course, southern fried chicken. #34 - Red Rooster Harlem: a favorite on Lenox Avenue, Red Rooster is owned by Andrew Chapman and Marcus Samuelsson who opened a restaurant that would have a positive impact in their neighborhood of Harlem. Named after an old speakeasy, the restaurant serves delicious soul food (try blackened catfish and grits with a slice of black bottom peanut pie) and music. #35 - Chocolat Harlem: located at 2223 Frederick Douglas Blvd and 120th Street, this lounge creates a one-of-a-kind experience that allows visitors to enter an urban and sophisticated world that pleasures the palate. Whether it’s an intimate evening for two or happy hour at the bar, dinner with colleagues or a family gathering for brunch, catching up with the girls or watching the game with the fellas; Chocolat has the ambiance to fit every occasion.